Dr. Eric G. Hoffman, a professor of meteorology in Plymouth State University’s Department of Atmospheric Science and Chemistry will present an exciting lecture about his experiences as a Storm Chaser. The lecture is Monday, Feb. 13 at 6:30 p.m. in Taylor Community’s Woodside Building. The event is free and open to the public. Doctor Hoffman received his B.S. in meteorology from Cornell University, and his M.S. and Ph.D. in atmospheric science from the University at Albany (SUNY). His areas of expertise include synoptic and mesoscale meteorology. 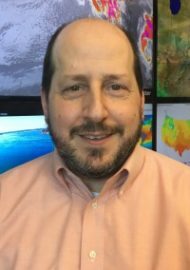 Prior to joining the PSU faculty in 2000, Doctor Hoffman worked for the National Weather Service as a meteorologist in the Monitoring and Aviation Branch of the former National Meteorological Center (currently the National Centers for Environmental Prediction) in Camp Springs, Maryland. While in graduate school, he worked as a part-time broadcast meteorologist for WGY-AM Radio in Schenectady, N.Y., and as a graduate research and teaching assistant for the Department of Earth and Atmospheric Sciences at the University at Albany.